Home » DIY home and garden craft projects » DIY Project ~ From Dumpster to Divine ! DIY Project ~ From Dumpster to Divine ! Heck, I really don’t cruise around looking in other people’s trash, but when I see something discarded that I could fix up, I just can’t leave it on the curb. 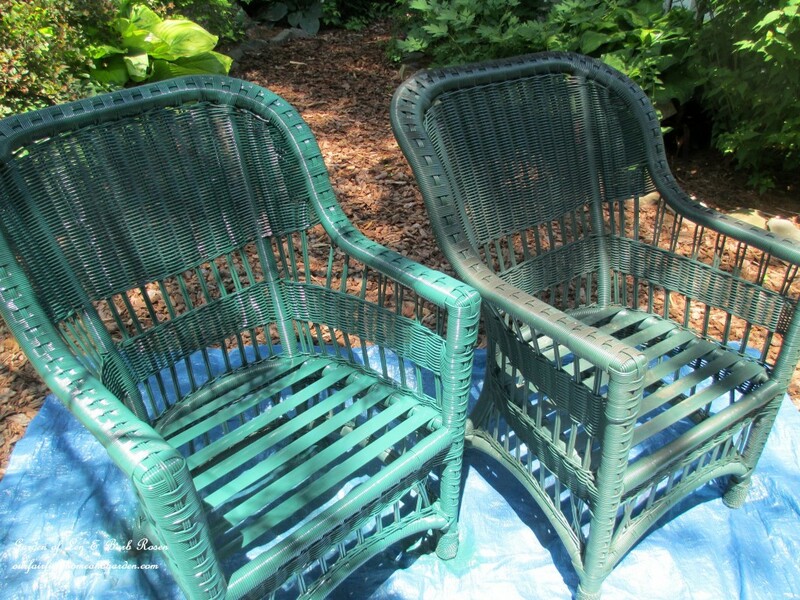 I was just out walking our Labs with my husband, innocently enough, when we passed two wonderful resin wicker chairs in a neighbor’s trash. 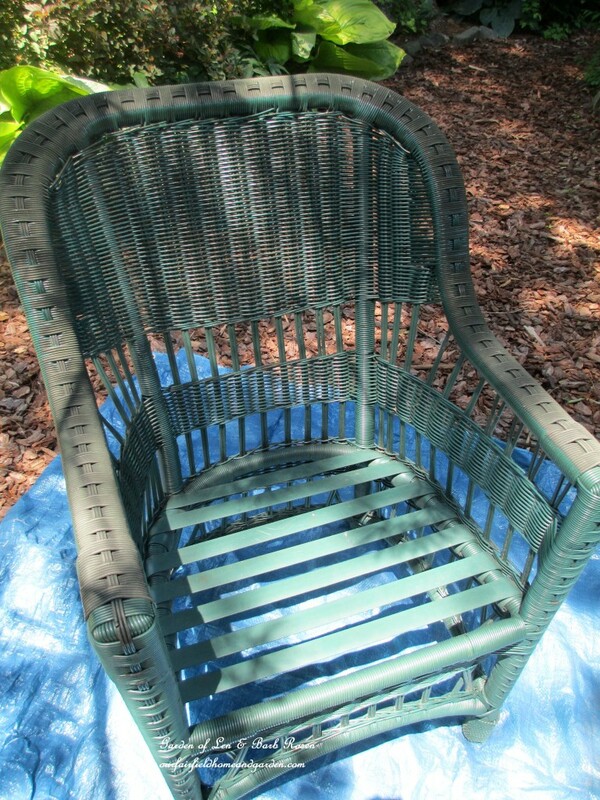 The chairs were in great shape except they had become discolored and the cushions were a mess. Before I could say anything, my sweetie, Lenny, said, “I know, we have to go get the car and pick these up right away!” Seems the man is catching on! We double-timed it home and zipped back to toss them into the back of our Subaru. 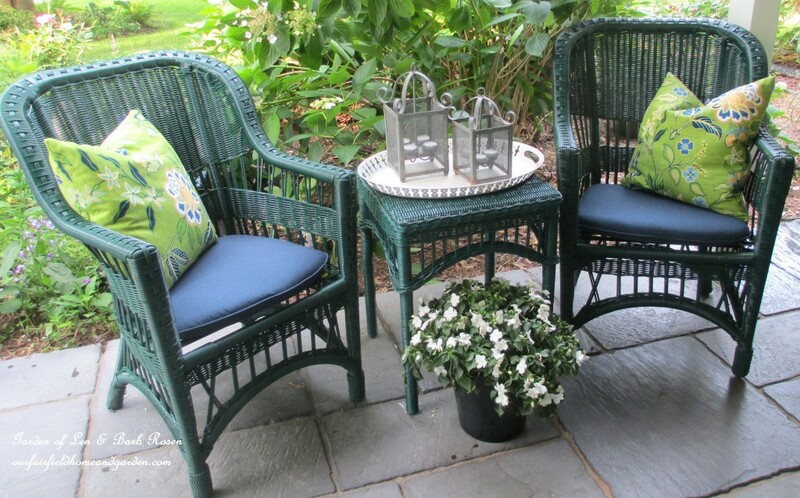 At first, I thought I might spray paint them white, as I just love the look of white wicker. Then I realized it would cost fifty or sixty dollars just for the paint and take a few days to change the color. Sticker shock convinced me that Hunter Green was a wonderful color to work with. The chairs got a good scrubbing and I went to Plan B. Without further ado, I picked up three cans of Rustoleum’s outdoor paint with primer in Hunter Green and got to work. After painting both chairs, I resurrected an old turquoise side table from the basement and painted it, too. That rounded out my set. 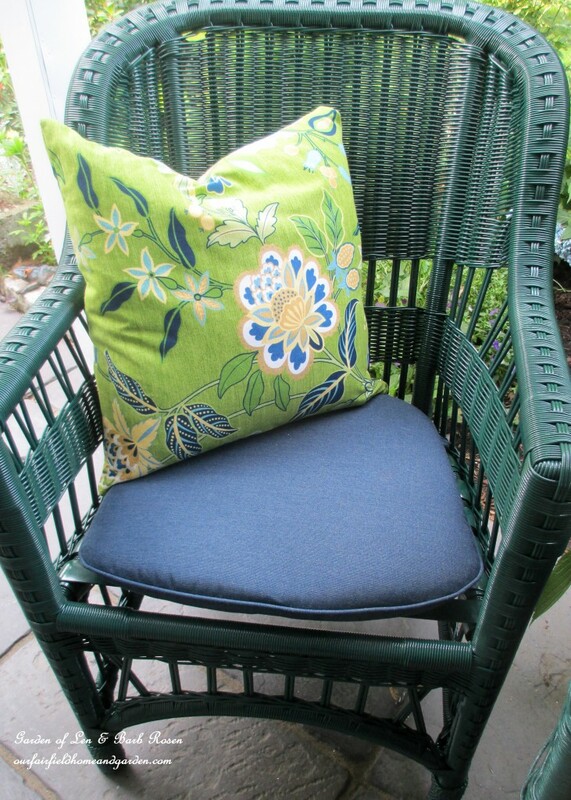 Then I found two seat cushions and a pair of pillows for thirty dollars to add the finishing touches. So, for $15 in paint, $30 in cushions and an afternoon’s work, I had myself a new wicker set for our front porch. Lenny was amazed when he saw our new porch set that cost less than fifty dollars. Bet he’ll not tease me about my trash picking anymore now! Check out the “Befores” and “Afters” pictured below! One chair down and one to go! Even better, the chairs are comfy too! I’ve been wanting extra seating on the porch for when friends and neighbors stop by – and now we have it! 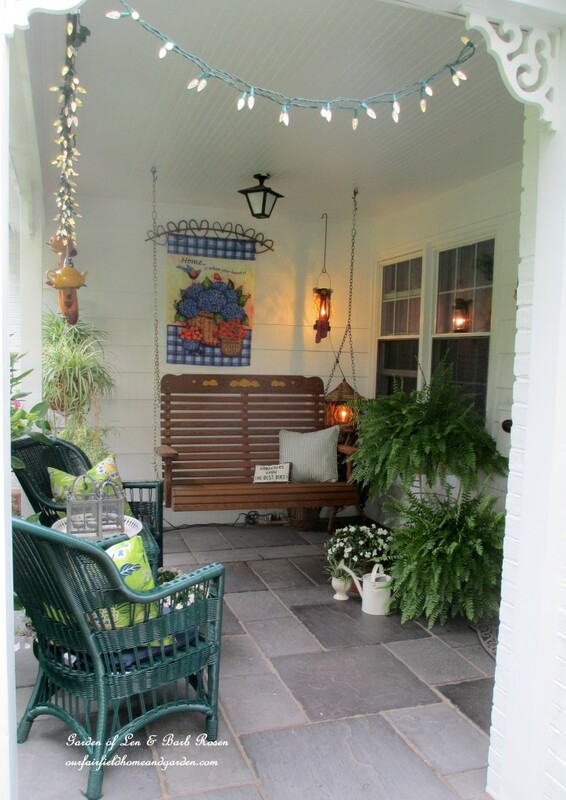 I see something on the left in the beautiful porch picture that looks like a teapot…please tell me more about whatever that is. Thanks for sharing the great pics! Wow Barb..you have him well trained..lol..I can’t believe what some people throw away..They look great! Actually, Nancy ~ he said it jokingly! But he isn’t laughing at me now! Lenny was amazed that when I got done it looked like a brand new set and he loves them.